This post is an adapted version of Mitchel Resnick's presentation at Thinking about Thinking about Seymour, an MIT Media Lab symposium on January 26, 2017, celebrating the work and ideas of Seymour Papert, who passed away last summer. Seymour Papert’s ideas about children, computers, and learning inspired so many people, in so many different ways. How can we keep Seymour’s ideas alive, even though he is no longer with us? What we can do to support the spread of his ideas, so that they continue to inspire children, parents, teachers, and researchers around the world? As I thought about these questions, the first phrase that came to mind was Putting Papert into Practice. But as I gave it more consideration, the phrase didn’t feel right. Seymour wouldn’t have liked it. It’s too simplistic to think that you can just take someone’s ideas and put them into practice. Seymour had a more organic view of teaching and learning—and a more organic view on how ideas spread. The process is not like an engineer building a structure according to specifications; it’s more like a farmer or gardener tending to plants, creating an environment in which the plants will flourish. Mitchel Resnick, speaking about Rethinking Learning. Other topics at the symposium included Rethinking Making, Rethinking School, and Rethinking Ideas. As I thought about it more, a new phrase came to mind: The Seeds that Seymour Sowed. That felt better, more in Seymour’s spirit. He was constantly planting new seeds, new ideas—some mathematical, some pedagogical, some technological, some epistemological. Some of Seymour’s seeds spread like wildflowers around the world; some took root in a few places, but not in others; and some of his seeds still lie dormant in the ground, waiting for others to provide the proper nurturing, the right conditions for growth. Let me share a story about how some of Seymour’s seeds began to take root. The story involves a 10-year-old boy named Nicky, who was participating in a workshop at the Media Lab in 1985. It was one of our first LEGO/Logo workshops, in which children were using Seymour’s Logo programming language to control their own LEGO constructions. Nicky started his project by building a car out of LEGO bricks, adding a motor, and connecting it to the computer. When he programmed the motor to turn on, the car moved forward a bit, but then the motor fell off the car and began vibrating across the table. Nicky became intrigued with the vibration of the motor, and he began to wonder whether he might be able to use those vibrations to power a vehicle. Nicky mounted the motor on a platform atop four LEGO "legs." After some experimentation, he realized that he needed to amplify the motor vibrations. To do that, he drew upon some personal experiences. Nicky enjoyed skateboarding, and he remembered that swinging his arms gave him an extra "push" on the skateboard. So, he added a LEGO “arm” to his machine. As the motor turned, the arm whipped around and amplified the motor vibrations, and the machine vibrated its way across the table. An important element of the story is that Nicky was given time and encouragement to follow his interests and curiosity. He wasn’t given a specific goal or specific task, as is typical in many classroom activities. Seymour recognized the importance of kids not just answering questions but also finding their own questions, developing their own projects. That was one of the seeds that Seymour sowed. When the motor on Nicky’s car fell off and vibrated across the table, Seymour and others at the workshop encouraged him not to see it as a failure, but as an opportunity for new explorations. Seymour recognized the importance of taking advantage of the unexpected. That was one of the seeds that Seymour sowed. When Nicky added a swinging arm to his machine, motivated by his skateboarding experiences, it was similar to the way that children use their own body knowledge to think through the movements of the Logo turtle. Seymour called this body-syntonic learning. That was one of the seeds that Seymour sowed. Now, looking at Nicky through a 2017 lens, we would call him a maker and a coder, engaging in computational thinking. Of course, back in 1985, no one was talking about a maker movement or a coding movement. But Seymour was laying the intellectual foundations for those movements—or, should I say, sowing the seeds for those movements. 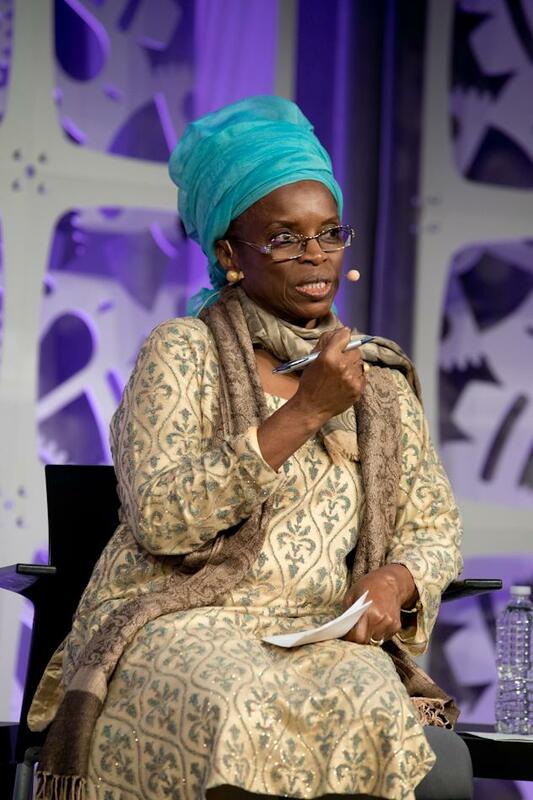 Fatimata Seye Sylla, taking part in a panel discussion about Rethinking the World. That doesn’t mean that Seymour would embrace everything that’s happening today under the banners of making and coding and computational thinking—just as he didn’t embrace everything that happened under the banner of Logo in the 1980s and 1990s. Seymour was frustrated when schools simply taught children to draw squares and triangles, and stopped there, never truly engaging with the powerful ideas of programming. As Logo spread around the world, he worried that the core ideas were becoming diluted; he even coined the term “epistemological dilution” to describe the process. I’m sure that Seymour would have similar concerns about many of the activities around making and coding and computational thinking today. And I’d agree with him. Even as new technologies proliferate, and more children are making and coding, Seymour’s powerful ideas are often missing. As I see it, the problem is not in Seymour’s seeds, but in creating the right conditions for them to grow. At the MIT Media Lab, as we work to support Seymour’s ideas, we sometimes organize our thinking around four core concepts, captured in four words: Projects. Passion. Peers. Play. 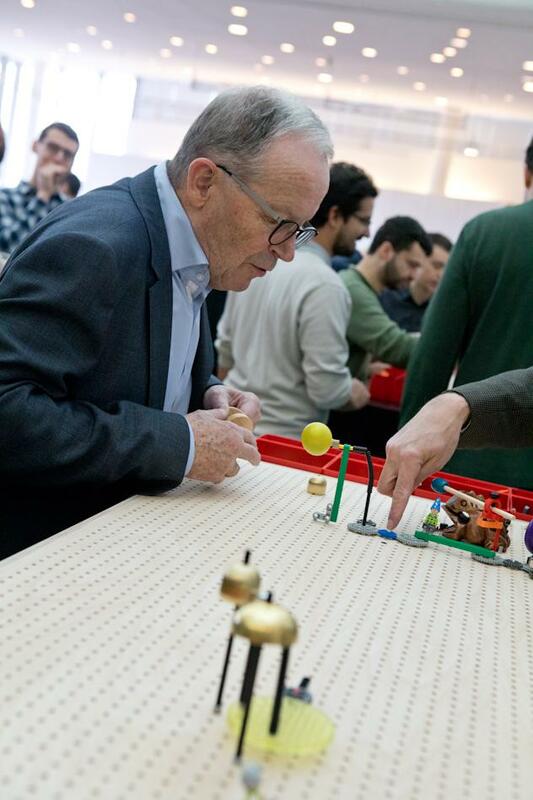 Kjeld Kirk Kristiansen, LEGO Group owner and member of the LEGO Foundation board, plays at one of the Tinkering Studio’s stations set up for the symposium. Projects. Many math and science educators place a special focus on problem-solving. Seymour took a provocatively different approach, arguing for “projects over problems.” Of course, he wasn’t opposed to problem solving, but he felt that it was important for children to engage with problems in the context of meaningful projects. His goal was for children not just to understand new ideas, but to use new ideas, to express themselves with new ideas, to become fluent with new ideas. And he saw projects as the best way to do that. Passion. In the foreword of Seymour’s seminal 1980 book, Mindstorms: Children, Computers, and Powerful Ideas, he describes how his childhood fascination with gears provided him with a way to explore important mathematical concepts. For me, the most important and memorable line in the foreword is when Seymour wrote: “I fell in love with the gears.” Seymour understood the importance of learners building on their interests and passions. He knew that people will work longer and harder, and make deeper connections to ideas, when they’re working on projects that they’re passionate about. Peers. Towards the end of Mindstorms, in the chapter titled “Images of the Learning Society,” Seymour wrote about the Brazilian samba schools where people come together to create music and dance routines for the annual carnival festival. What most intrigued Seymour was the way that the samba schools bring together people of different ages and experience levels. For Seymour, this type of peer-based learning was at the core of a Learning Society. Play. Often, people associate play with laughter and fun. But for Seymour, play involved experimenting, taking risks, testing the boundaries, and iteratively adapting when things go wrong. He sometimes referred to this process as “hard fun.” And Seymour didn’t just encourage play and hard fun for others; he lived it himself. He was always playing with ideas, wrestling with ideas, experimenting with ideas. I never met anyone who was, at once, so playful and so serious about ideas. 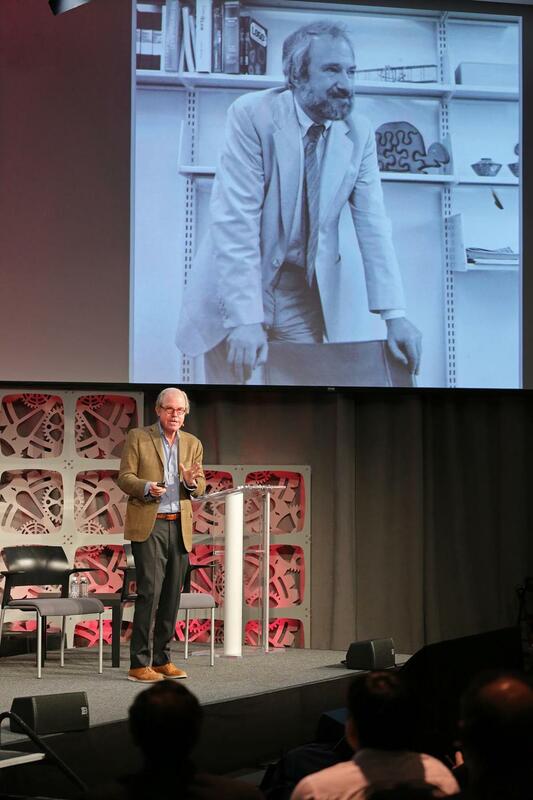 Media Lab co-founder and Chairman Emeritus Nicholas Negroponte spoke about Rethinking Media. He told the crowd how 50-plus years of knowing Seymour influenced his own ideas. For me, these four P’s represent four of the most important seeds that Seymour sowed. In my Lifelong Kindergarten research group, as we develop new technologies and activities, we’re always thinking about these four P’s, to make sure we stay aligned with Seymour’s ideas. A few years ago, I made a presentation about my research at an educational technology conference. In the Q&A that followed my talk, someone asked, rather aggressively: “Wasn’t Seymour Papert trying to do the same things 20 years ago?” The comment was meant as a critique; I took it as a compliment. I answered simply: “Yes.” Indeed, almost all of my work is directly inspired by Seymour’s ideas, and I have no shame about that, only pride. I fell in love with Seymour’s ideas more than 30 years ago, and I never fell out of love with them. I continue to feel that Seymour’s ideas provide a vision for the type of society that I want to live in. I will be happy to spend the rest of my life working to nurture the seeds that Seymour sowed. 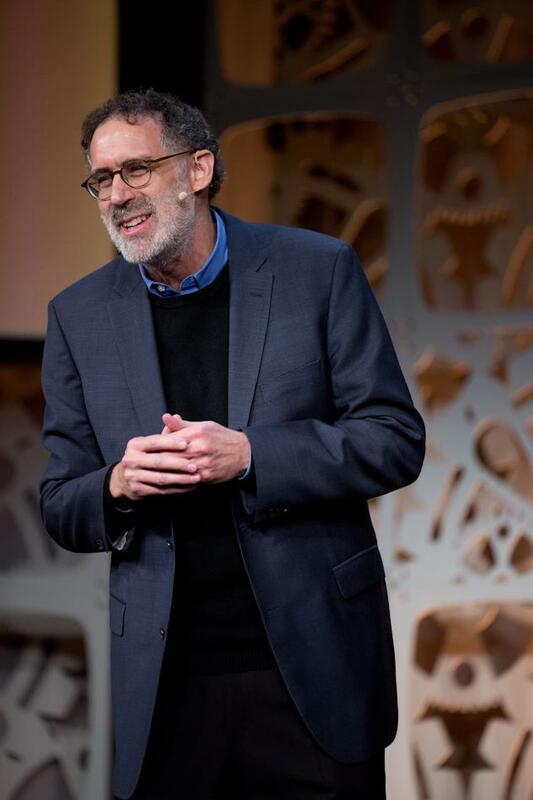 Mitchel Resnick is head of the Media Lab’s Lifelong Kindergarten research group. You can download a free pdf of Mindstorms here, where you can also add your comments and reflections. The Media Lab is grateful to Seymour Papert’s family for allowing us to share the Mindstorms text.